For the 2009 model year, all Ford Escape models receive standard cruise control. In addition, the Escape receives more power across the line, courtesy of a new 2.5-liter 4-cylinder engine that replaces the old 2.3-liter powerplant on both the standard models and the Hybrid, and a stronger V6 that now produces 240hp. 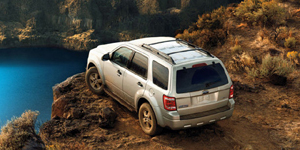 The 2009 Ford Escape SUV is powered by a base 2.5-liter Inline-4 with 171 hp. Also available is a 3.0-liter V6 with 240 hp. The 2009 Ford Escape Hybrid is powered by a 2.5-liter Inline-4 with 153 hp.